Standing between Westminster Abbey, and the Westminster Palace, St Margarets Church could be overlooked. It forms part the the World Heritage Site listing together with these two. 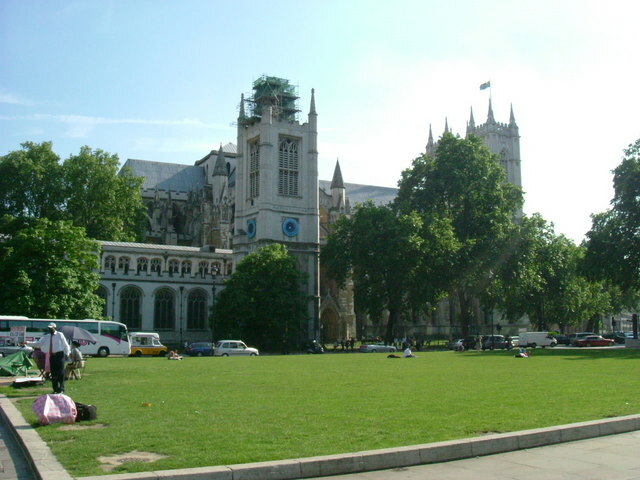 Westminster Abbey started out as a St Peters Benedictine monastery, the abbey church was used by the monks a number of times each day for their services. Nothing was supposed to disturb the monks in their duty to undertake this. The monks of St Peters Abbey found that the people who came each day to hear mass disturbed them, so they set about building a smaller church for the people next to the abbey in the second half of the 11th century. This also happened in other places and often next to or as a part of an abbey ruin you will find the remains of the church next to it, or in many cases a working parish church still. The Church built by the monks at Westminster they dedicated to St Margaret of Antiock, a popular dedication in the middle ages but little is known about this saint today. As was common practice the monks of the abbey ministered to the growing flock, up to the dissolution of the monasteries by Henry VIII in 1540. There have been since a number of churches on this site, or variations to its design. The first church was Romanesque in style created in the second half of the 11th century. In the reign of Edward III (1327-77), the nave was replaced with one in the Perpendicular style, the chancel still being in good repair at that time. Towards the end of the 15th century, the whole church had fallen into a state of dilapidation that it needed almost total reconstruction. Robert Stowell started to rebuild the church in 1482. The work continued over many years and the church was consecrated on 9 April 1523. Restorations in the 18th, 19th and 20th centuries, the structure is still substantially the same as it was in 1523. In July 1189, the Abbot and Convent of Westminster received a grant from Pope Clement III which confirmed that St Margaret's Church was outside the jurisdiction of the Bishop of London. In 1222, the Abbey and its property was declared not only to be outside the diocese of London but also exempt from the authority of the Archbishop of Canterbury. When Elizabeth I re-founded the Abbey as a collegiate church in 1560 she maintained its exemption from Episcopal authority and made her new foundation a ‘Royal Peculiar’, subject to the authority of the Sovereign as Visitor. St Margaret’s church and parish were part of this peculiar jurisdiction until 1840. In 1840 it was placed within the diocese of London. 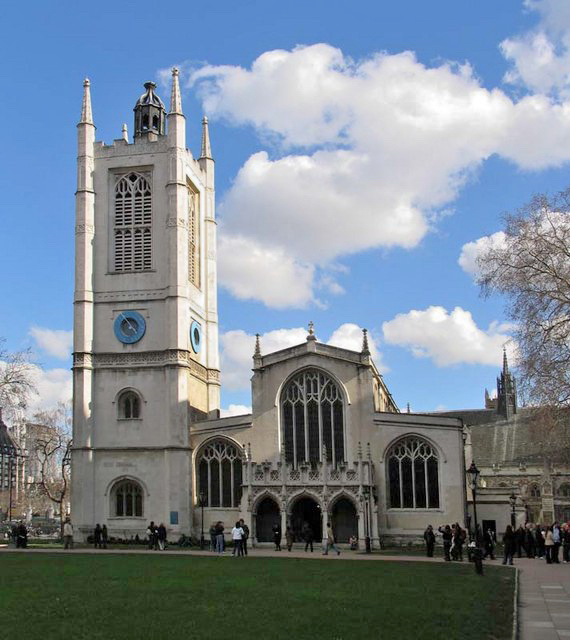 By the 1970s the resident population of St Margaret’s parish had dwindled to a few hundred and in 1972 the Westminster Abbey and Saint Margaret Westminster Act redefined the church’s status. Its parish was re-allocated to neighbouring parishes while the church and its churchyard were placed once more under the governance of the Dean and Chapter of Westminster, with one of the Canons of Westminster serving as Rector of St Margaret’s. Google You can also position the little man on the map to see a street level photo from the roads around. Getting there: Nearby Tube station is Westminster on the Circle, Jubilee and District lines. You can check by phone that nothing is on at the church when you plan to visit. Notes: Wheelchair access to St Margaret's is via the North Door. Either arrange entry prior to your visit by calling the Vestry on 0207 654 4840 or ask the Verger on duty for assistance on arrival.